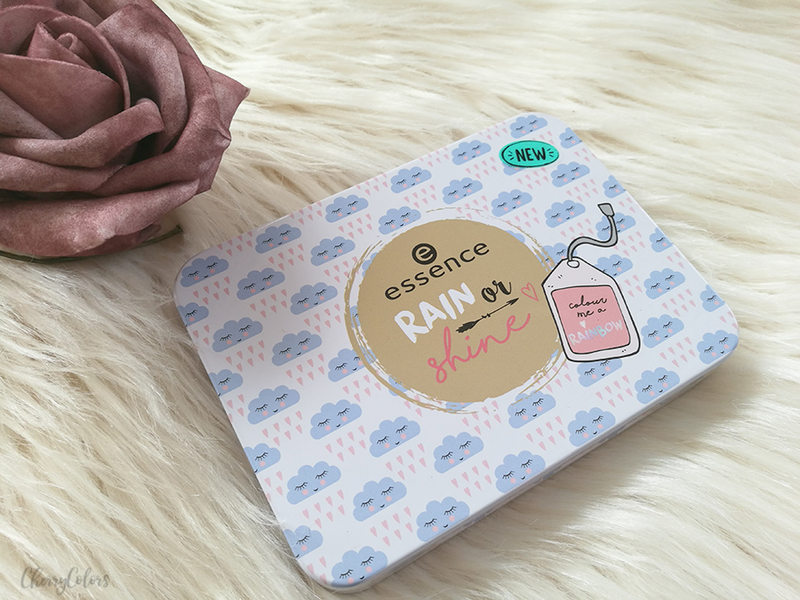 Essence Rain or Shine Palette - Cherry Colors - Cosmetics Heaven! 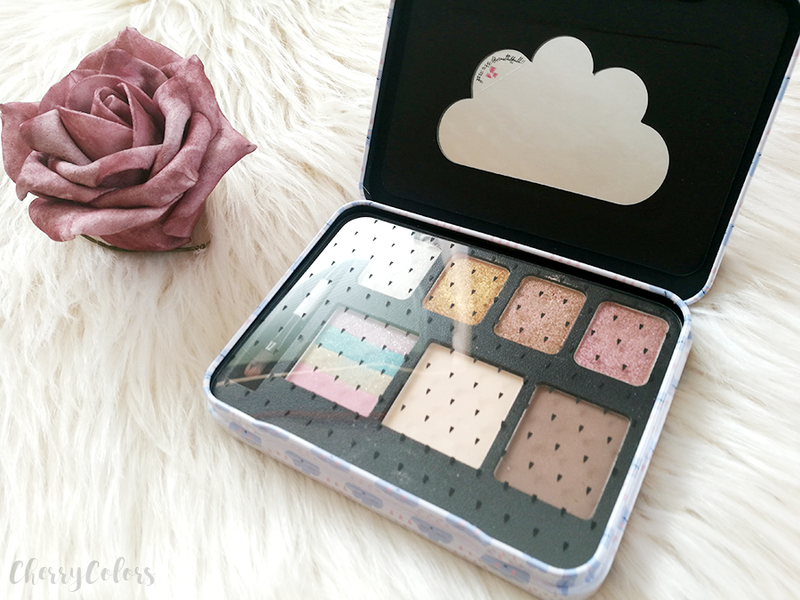 With all the new things that came on the Essence stands, this palette is something that got my attention. It's called Rain or Shine. The design is adorable - a metal box with four eyeshadows, a translucent powder, an eyebrow powder and a rainbow highlighter. And today I'm here to tell you all about it. he two “eye & face” palettes in a cool metal box are true multi-talents: the “rain or shine” version inspires with holographic pastel shades while the “superpower!” palette unites light, colourful shades. includes a multi-purpose brush. How does it look inside? The palette comes covered in a plastic foil with tiny raindrops. Adorable! Under the plastic film, there's a double-sided brush which is actually kind of nice as it is very soft. In the palette, you'll find four different eye shades, a rainbow highlighter a setting translucent powder and an eyebrow powder. I had no idea what were the last three things as there's no real info online (but it is written on the box!). I tried using the translucent powder as an all over color on my eyelids to no avail. I also thought the brown color was a bad eyelid color. Well, now I know! The only thing that I care about in it are the eyeshadows. They are mesmerizing. The color changes as you move / in different lighting. 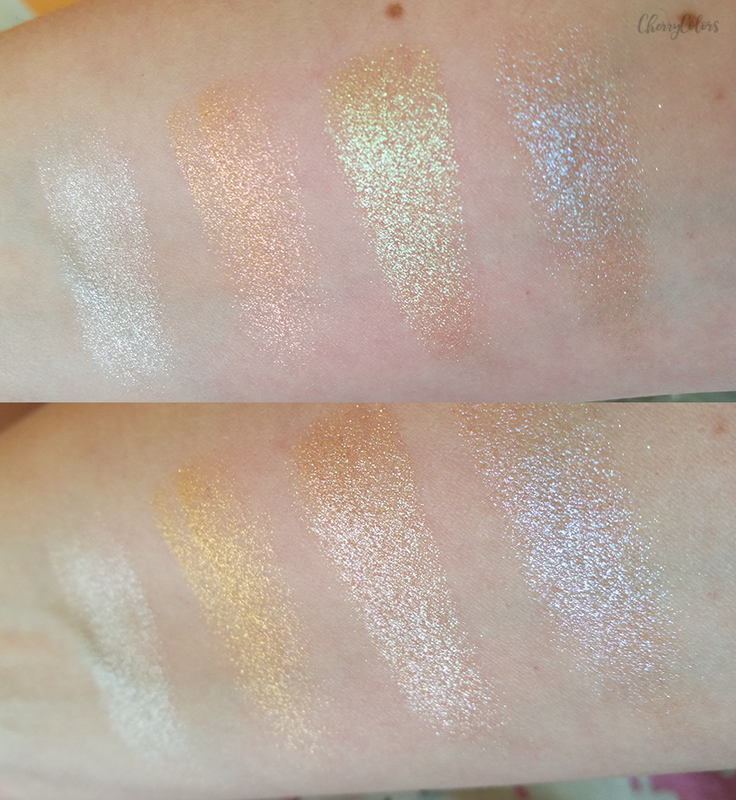 The eyeshadows are soft, buttery and easy to work with. I am really impressed with the formulation on these. It's brilliant! These are made from micro duochrome glitter. It is very gentle on the lids and doesn't feel like glitter at all. 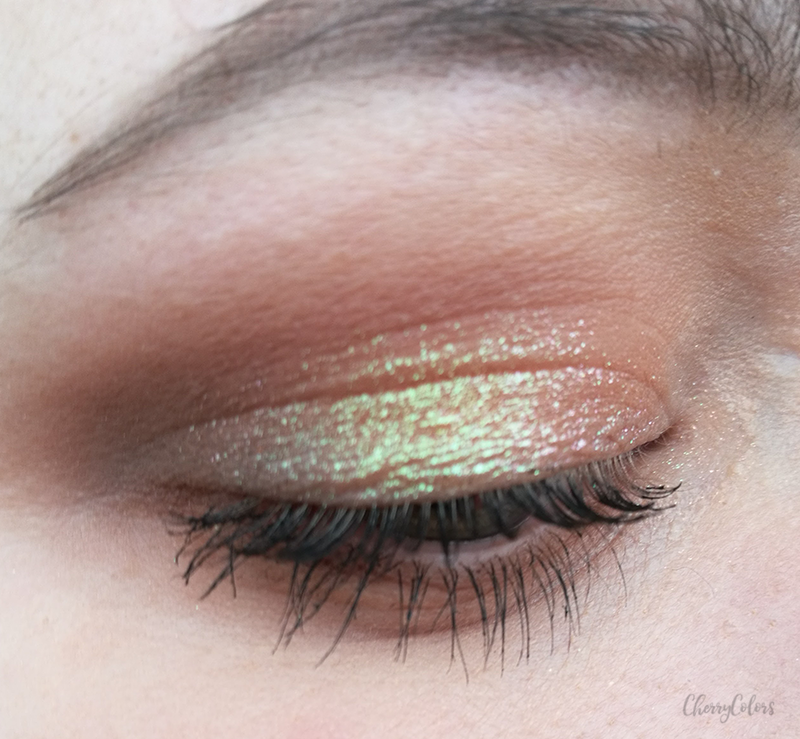 I created two looks with two shadows - the second one (goes from bronze to rose gold) and the third one (goes from brown to green). 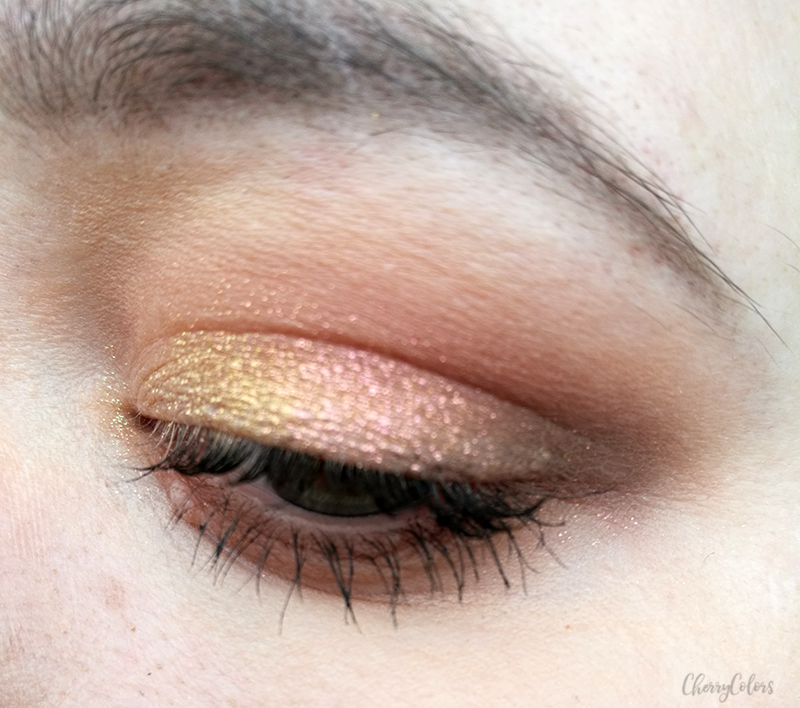 For my crease and outer V, I used the Makeup Revolution Pro HD Luxe palette. This was my main concern. My eyelids are oily and sometimes (mostly during the Summer) things would move around in my crease. Well, luckily, these stay put. They don't more. They do however move in my crease during hot days (as do all my other eyeshadows, even the high-end ones). After twelve hours of working, they are where they should be. 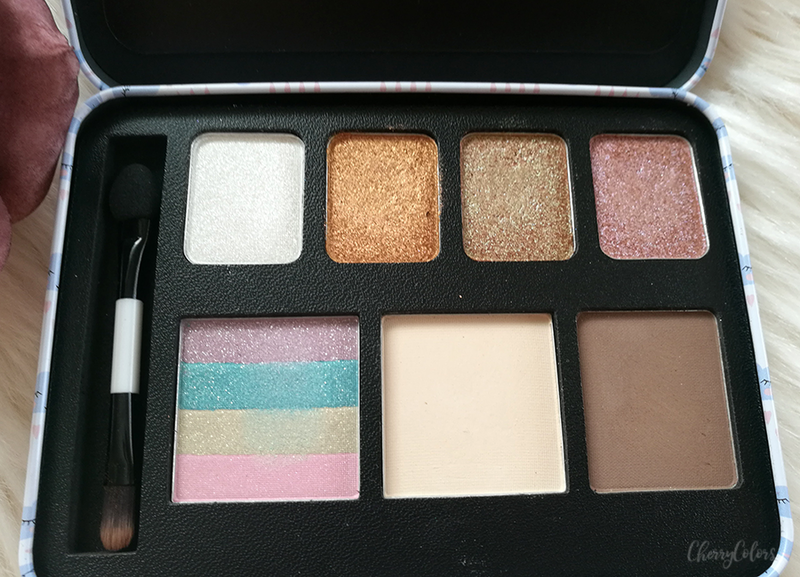 - I feel that the eyebrow powder, translucent powder, and highlighter are kind of "meh"
The design, the packaging and the feel of this palette are really cute. I was looking for glittery eyeshadows that would feel lovely on the lids and for which I wouldn't have to spend a fortune. Well, these are exactly like that. Great quality, long lasting and just overall great. There is a light fallout of the glitter while you apply it, but it's nothing dramatic. I do feel that the other pans in the palette are kind of random and that if I tried using the translucent powder with a brush the color would be all over the palette. But I don't mind. The eyeshadows alone are well worth the price of the palette (8€). I really recommend it to all of you who love glitter. *The products were sent to me by the company or their PR for review purposes. My reviews are always honest. This post contains affiliate links.